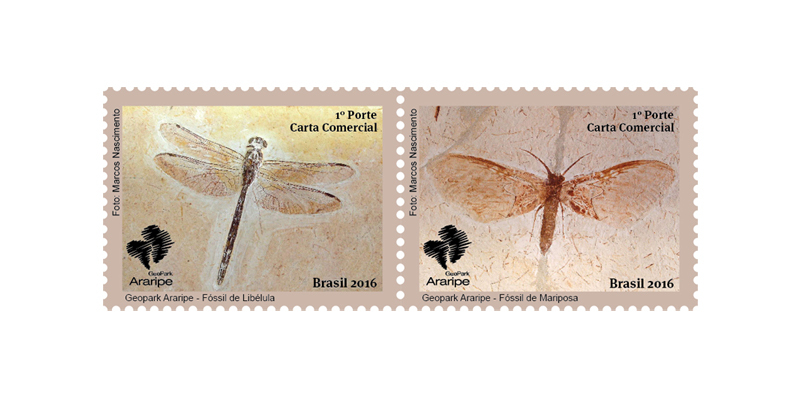 In this issue, the Post Office presents the Araripe GeoPark, addressing the biological, geological and paleontological importance of this fantastic natural universe of the Brazilian Northeast. Created in 2006, it’s the first geopark in the Americas, recognized by the United Nations Educational, Scientific and Cultural Organization - UNESCO. 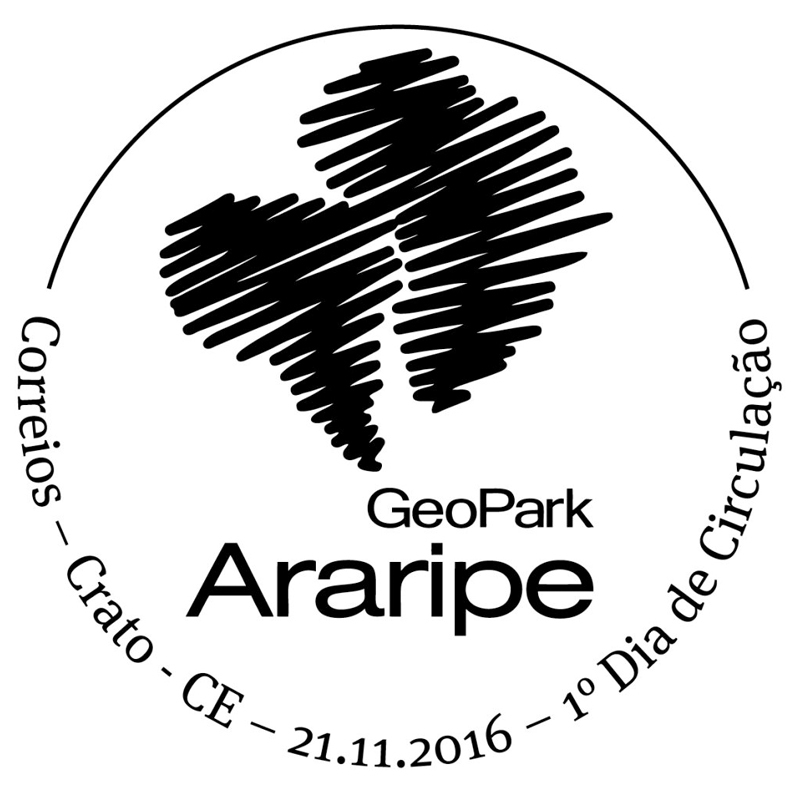 Palaeontological Heritage The territory of 6 (six) counties that make up the Araripe GeoPark has a natural history of millions of years. These landscapes were marked by the merging and splitting (still ongoing) of South America and Africa. A story that saw the geological structure of the largest sedimentary basin inside the Brazilian territory, the Araripe sedimentary basin, which received the influence of marine waters, whose relationship left testimonies only on rocky screens that open-air museum. Thus, in the Araripe GeoPark, Regional University of Cariri (URCA) are two of the main deposits bearing layers of Brazil and of the world: Crato formations and Romualdo, with amazing specimens showed at the Museum of Paleontology of URCA. The Crato formation is composed primarily of laminated limestones. Here the most varied groups of living things are found, and it has also an abundant fossil number per square meter, well preserved with soft tissue, tablets or in the form of prints. Romualdo formation consists of shales with levels of carbonate concretions, in many of them are found fossils, mostly fish, but also has the presence of pterosaurs, turtles, crocodilomorfos, dinosaurs and plants. Together, these formations are considered a Konservat Lagerstätte, because strata fossils in an excellent state of preservation are present, and make up part of the unique natural heritage of Cariri from Ceará, whose conservation is one of the basic objectives of the Araripe GeoPark. Dragonfly Fossil - the dragonfly, a symbol of the Museum of Paleontology of URCA, in Santana do Cariri-CE, is one of the most beautiful and impressive fossils that compose the collection of this Museum and is a true icon of the Araripe GeoPark and the Brazilian Paleontology. In the past, at least 120 million years ago, around a large lake, several species of dragonflies were hovering above its waters. The dragonfly fossils of the Crato formation are extremely similar to dragonflies found in Chapada do Araripe. These insects are part of the Odonata Group, which has a life cycle that is closely connected to water bodies and which appeared in the Paleozoic, conserved, until today, with the same general morphological characteristics. Moth Fossil - the Emperor moth, known scientifically as the Lepidoptera, flew through the air of the region that today is Brazil in the early Cretaceous, mainly during the deposition of plated limestone of the Crato formation. Lepidoptera fossils are extremely rare in these rocks, and the vast majority of fossils are from isolated wings. Thus, this beautiful specimen from the Museum of Paleontology of URCA is unique due to the exceptional preservation of the entire body of the animal, including delicate parts such as the antennas. The most extraordinary aspect of this fossil is the preservation of the color pattern of the wings of the butterfly.